I had to sub a few ingredients one of which was a homemade mild lamb Merguez sausage that I had frozen and good lord of all things cottage cheese instead of ricotta! I thank Gretchen for this recipe and it makes a large pan, I cut the recipe in half. I had to doctor the cottage cheese, drained it for an hour or more and perked it up with some of the parmesan and a sprinkling of mozzarella which made better tasting “custard” in the end. Spray cookie sheet with Pam or just oil it and bake eggplant at 350 for 20 minutes or until done. Set aside. Brown meat and drain fat. Heat 2 TBS olive oil in pan and cook onions and garlic until golden but no brown. Add browned meat and cook 5 minutes. Combine wine, tomato paste, cinnamon, parsley, salt and pepper. Stir into meat. Simmer gently, stirring frequently until all the liquid is absorbed. Set aside. Prepare topping by melting butter, whisking in flour. Slowly add hot milk, stirring constantly until thick and smooth. Remove from heat and cool slightly and stir in beaten egg and ricotta. I added the cheese first then the beaten eggs. Grease a lasagna pan (a foil lasagna pan works well–this makes a deep casserole). Sprinkle the bottom with bread crumbs. 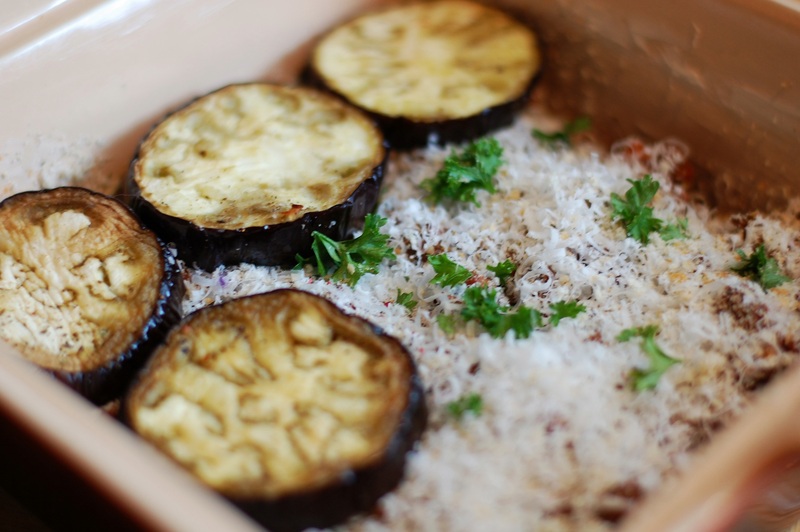 Arrange alternate layers of eggplant and meat mixture, sprinkling each layer with bread crumbs and parmesan cheese. Top with the cheese custard. Bake 1 hour or until top is puffy and golden brown. Cool 20-30 minutes before cutting. Serves 8. This will freeze very well. Cover with plastic wrap in contact with the topping and then aluminum foil. Thaw before cooking.